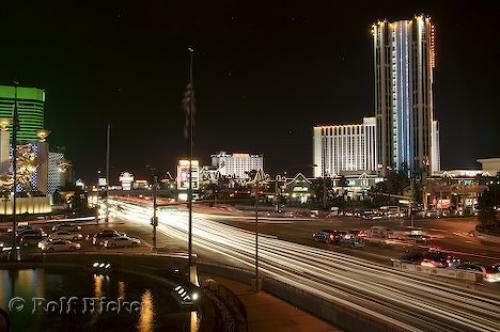 There are many events happening along the Strip in Las Vegas, Nevada, USA. Las Vegas, Nevada in the USA is a city that is full of thrills, excitement, special events, casinos, billboards and flashing lights. Las Vegas never stops, sleeps or rests and boredom is not a factor in this incredible city.You can walk down the strip from hotel to hotel or casino to casino and find illuminated billboards advertising a variety of spectacular events to see. Las Vegas, Nevada has a long list of famous people that perform, sporting events, theatres, art events, museums and every hotel has its own agenda of special events that happen on a regular basis.Pamphlets are available throughout Las Vegas to help you find which of the many events you are looking for and where to buy tickets. One four or five day vacation to Las Vegas, Nevada does not even begin to scratch the surface of the wonderful events to see in this fascinating city.Vegas Strip, Las Vegas, Nevada, USA, North America. Photo of the Las Vegas Strip where billboards advertise the different events that occur in Las Vegas, Nevada.